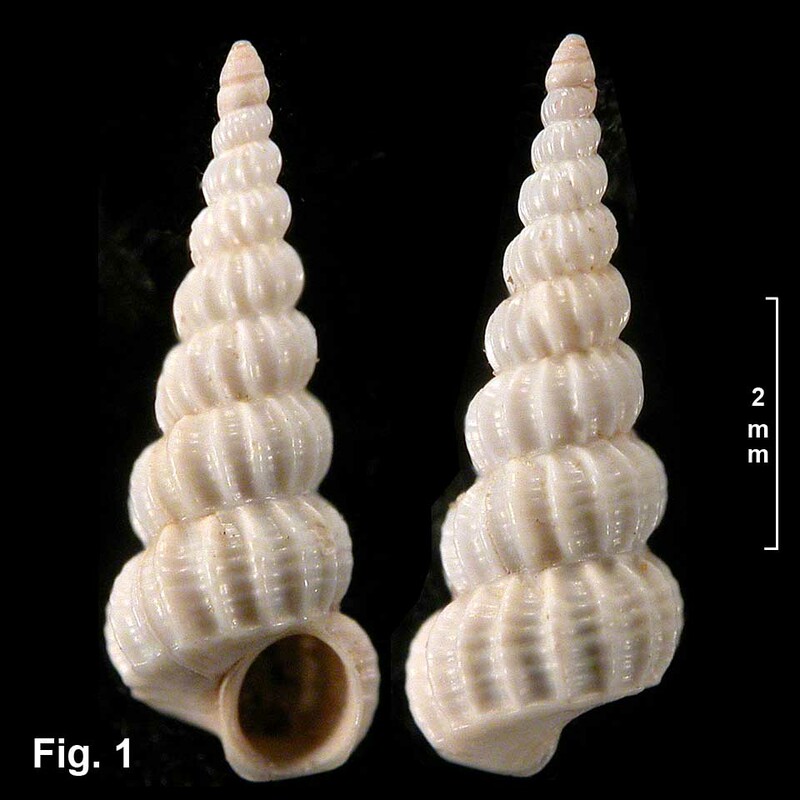 Description: Shell tall and slender, of up to 10 teleoconch whorls. Protoconch of 4 whorls, with dense axial riblets throughout and spiral threads at top of whorls. Teleoconch whorls well rounded, with very strong axial ribs. Ribs not aligned from whorl to whorl, about 16 on last whorl of mature shells. Spiral sculpture of low, wide cords commencing on about fifth whorl, 4-7 on last whorl, variable in strength, overriding axial ribs and sometimes forming nodules at intersections. Last whorl with basal cord level with top of aperture, terminating axial ribs; base smooth below basal cord. Aperture oval, outer lip thickened with varix externally. Umbilicus closed. Colour white. Size: Up to 11 mm in length. Distribution: Endemic to Australia; Broken Bay, NSW, southwards to eastern Bass Strait. Habitat: Known from 146-1463 m. Uncommon. Remarks: When this species was first described, the accuracy of the collection locality was questioned, as the shell was unlike any Australian species known at the time. But the Australian Museum collection now holds 17 lots of this deepwater species from eastern Australia, from depths down to 1463 m, so the type locality data is correct.